In a major setback for ruling BJP party today 197 members of BJP switch over their loyalty with the Congress in Lekang Assembly Constituency . A joining programme which was held at the Rajiv Gandhi Bhawan here today where 197 BJP party workers today joined congress who were welcome by the APCC President Takam Sanjoy. One of BLC President of Mahadevpur-I BK Deori informed that many year we have been electing Chowna Mein from our constituency but he have failed to delivered the goods to the masses of his assembly constituency. He said our elected leader failed to give protection from flood by river Noadehing. We are against his activities and we have never been benefited from him in the development of the area. Another BLC President from Shivpani Moran Goan Kumeshwar Neog said that a mass joining programme is being held at Lekang on 16 wherein more than 500 workers/members from BJP would be join to Congress. Out of 28 BLC 20 BLC have joined Congress and major joining will be on February 16. 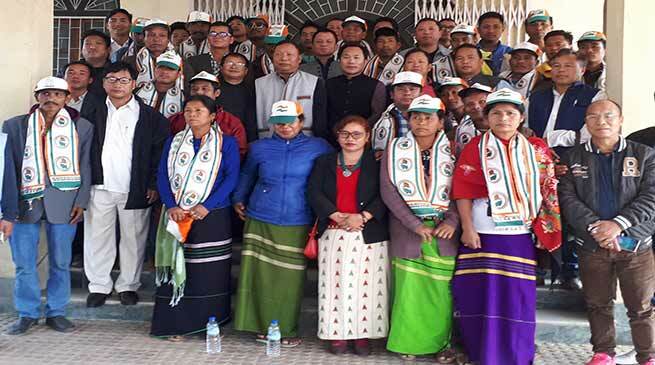 Several Congress leaders were present during the joining programme which include former Minister Bida Taku, General Secretary Tamchi Tahar, Chera Taya, Nune Tayeng, Charu Tuglo, Spokesperson Hina Camdir Tok and others.